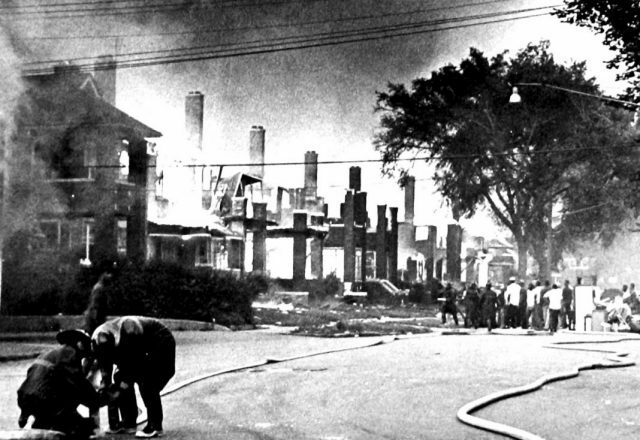 Racial tensions in Detroit, from police mistreatment and economic disparity to discriminatory housing practices, had been smoldering long before the spark that ignited the riots in Detroit on July 23, 1967, when Detroit police raided a blind pig at 12th Street and Clairmount in what from 1930-32 was a temporary home to Congregation Shaarey Zedek. It took more than a week for the U.S. Army, the Michigan National Guard, the Michigan State Police and the Detroit Police to restore order. Some 1,300 buildings had been burned and 2,700 looted. Many, but not all of the 78 Jewish-owned stores in the area were looted. Some 5,000 people were left homeless by the fires. 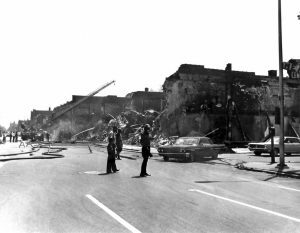 When the smoke cleared, the period of violence had claimed 43 lives, mostly black, and injured more than 700. Over 7,000 individuals were arrested, with property damage estimates exceeding $75 million. Members of the Jewish community were actively involved in civil rights and justice issues during the years before and after the 1967 riot, also known as the “Great Rebellion” among African Americans. Four of those leaders sat down with the Jewish News to discuss their memories. Violence was nothing new on 12th Street, once home to the notorious Purple Gang, a ruthless group of Jewish men who thrived on the illicit alcohol trade that flourished in Detroit during Prohibition. In the heart of the Jewish community, the street once boasted shop after shop of Jewish-owned businesses. The racial makeup of the street began to gradually change from the 1950s on. As housing restrictions began to ease, middle-class black families began to move in from the east side. For a few years, there was a peaceful coexistence among black and Jewish neighbors. 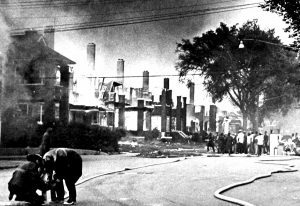 However, with urban renewal, Black Bottom, the home to many poor African Americans in Detroit and once home to the Jewish community, was razed. Those blacks now followed the Jews over to 12th Street, sometimes referred to as the “golden ghetto,” which had begun to deteriorate in the years before the riot. The area had the highest crime rate in the city. 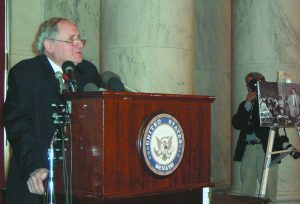 Former U.S. Sen. Carl Levin describes the constant tension between the police and the local African American community. 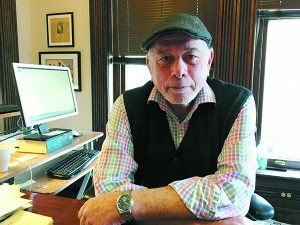 Levin had left his position as general counsel for the Michigan Civil Rights Commission the year before to help create the Detroit Defender’s Office, where he became appellate defender, handling the appeals of indigent people convicted of crimes. 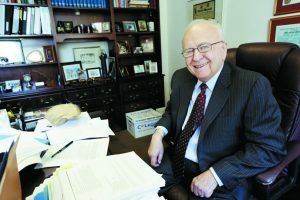 Jewish attorney Bruce Miller was active in civil rights issues long before the 1967 riot as part of the Detroit branch of the NAACP, where he later became general counsel. He became involved in two areas: discrimination in local labor unions and police brutality. He successfully garnered the first state censure against a Detroit police officer for brutality and went on to create a Citizens Review Board for the Detroit Police Department. He understands the anger black Detroiters felt during the times leading up to the riot. “There certainly was a lot of tension. It was a case where there appeared to be no redress for any wrongs,” he says. Miller did something dramatic. He took Ms. Jackson downtown and parked her on Mayor Jerome Cavanagh’s doorstep “so the mayor would know firsthand what police brutality looked like.” The move got plenty of media coverage. “The mayor never forgave me,” Miller says. Miller also filed a complaint with the Civil Rights Commission. It took years, but Miller eventually succeeded in getting the police officer who brutalized Jackson censured. 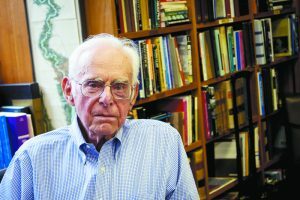 Renowned civil rights attorney Bill Goodman was visiting his parents the day the civil disturbance started. As a young lawyer, he had joined his father Ernest Goodman’s law firm, Goodman, Eden, Millender and Bedrosian, which was the first racially integrated law firm in the United States and concentrated on constitutional and civil rights issues. He had also spent some time in the South, working on civil rights cases at a small firm in Virginia. When he returned to Detroit, he handled police misconduct and abuse cases. Goodman said that as he drove home from his parents’ house in Southwest Detroit, he could see all sorts of people streaming out of storefronts carrying things and people being arrested. “The riot, or as I prefer to call it the Uprising or Rebellion, because it really was that, was the result of police oppression of the African American community,” Goodman says.“It was clear to know that was what it arose from: an all-white police force policing a large and growing African American community and doing so in a way that was blatantly discriminatory. “They arrested scores of people and locked them up in a detention center and in tents on Belle Isle, charging them with misdemeanors,” Cohn says. Goodman said people were held at Belle Isle for days and days and then brought in on buses to Recorder’s Court. “These were people who had been guilty of nothing more than a curfew violation — somebody who had happened to be out late at night,” he says. Goodman joined with colleagues and friends in the National Lawyers Guild and gathered in Recorder’s Court. “We waited for names to be called and for people to be brought up and volunteered to represent them,” he says. When they were overwhelmed by the sheer numbers of people, they assigned clients to other lawyers as well. Cohn took a seat on the newly formed police commission after the riot, where he supported a program of quotas for the police department. Levin turned to politics to make a difference in justice. He was elected in 1969 to the Detroit City Council and took office in 1970. He came in third out of nine city council members. Four years later, he became president of the Detroit City Council. During his tenure, hiring factors in the Detroit Police Department changed significantly, creating a work force that more closely resembled the city’s population. Goodman’s experience during the Rebellion, he says, led him to his life’s work of helping to maintain civil rights and constitutional liberties for countless Americans. He spent many years in New York as the legal director at the Center for Constitutional Rights, where he represented Vietnam veterans who were victims of Agent Orange, the wrongfully convicted and detainees at Guantanomo Bay, to name just a few. He returned to the Detroit area in 2007, opening Goodman and Hurwitz in Detroit with Julie Hurwitz. Miller continued with the NAACP for a while until there was a change in leadership with the rise of the black militant movement. “I was always an integrationist, so I didn’t fit in,” Miller says. Before the riots, the Jewish and black communities’ relationship was largely in the purview of the Jewish Community Council (now the JCRC), Cohn recalls. “As a result of the riots, concern about the relationship among blacks and Jews as well as the general population became the responsibility of the Jewish Federation itself,” Cohn says. “A special committee was appointed by Federation’s board of governors. Alan E. Schwartz was chairman of that committee, and I was a member. We tried to set up a dialogue. The day after the riots started, a group of Protestant, Catholic and Jewish leaders met to establish the Interfaith Emergency Council. Shortly after, civic leaders formed New Detroit, a private citizen’s council focused on urban renewal. Max Fisher was the only Jewish person tapped to join the committee. Within months, Jewish leaders Stanley Winkelman, Mel Ravitz, Alan Schwartz and Norman Drachler also joined. More than half the Jewish businesses in the Seven Mile-Livernois area and 12th Street neighborhood fled the city, including Stanley Lipson who owned Sam Lipson’s Variety Store on 12th Street, which was looted and burned. Ironically, Lipson had long attempted (unsuccessfully) to form a biracial merchants’ association. It’s unclear why his attempt failed. In the wake of civil uprisings in places like Ferguson, Mo., and Baltimore, Md., largely sparked by police violence against African Americans, one has to wonder if another riot could happen in Detroit. 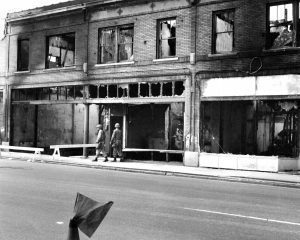 Nearly 50 years after a police raid at 12th and Clairmount streets ignited violence and carnage, the Detroit Journalism Cooperative, which includes the Detroit Jewish News, is exploring whether conditions that produced the civil unrest have improved for Detroit residents in a series of stories called The Intersection. Look for future stories from the JN on this project throughout 2016. To see all the stories done by our partner media agencies, go to wdet.org/series/detroit-journalism-cooperative. Historical data was taken from Harmony & Dissonance: Voices of Jewish Identity in Detroit by Sidney Bolkosky (Wayne State University Press, 1991); Metropolitan Jews by Lila Corwin Berman (University of Chicago Press, 2015); Hurt Baby Hurt by Walter William Scott (Ghetto Press, 1970); and The Great Rebellion: A Socio-economic Analysis of the 1967 Detroit Riot by Kenneth Stahl (2009). ← What Does Flint’s Water Crisis Have To Do With Your Seder? The timing on your article is perfect! I teach at a school in Southfield, and had planned on doing this as a social justice piece for my senior English class, looking at where we have been and where we are going, and asking the question “Has anything changed?” Thank you so much!